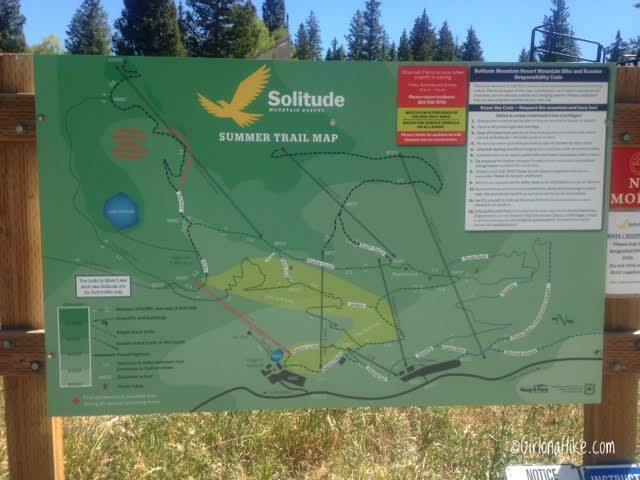 I also just happened to have two free lift tickets to Solitude to play at their disc golf course. 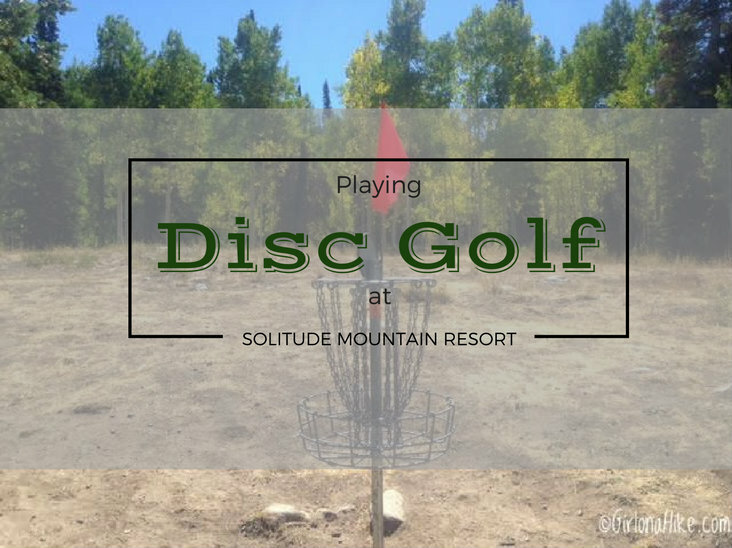 Solitude's course is a premier, high altitude, mountainside disc 18 hole golf course - also considered one of the toughest courses in the area. The hole lengths range from 250 ft to 1,200 ft. As a newbie, this made me a bit nervous. I don't even throw frisbees regularly for Charlie at the dog park! How was I going to get a disc in a basket hundreds of feet away?! I had to remind myself that I was a beginner, and most likely would not make any of the baskets in par. 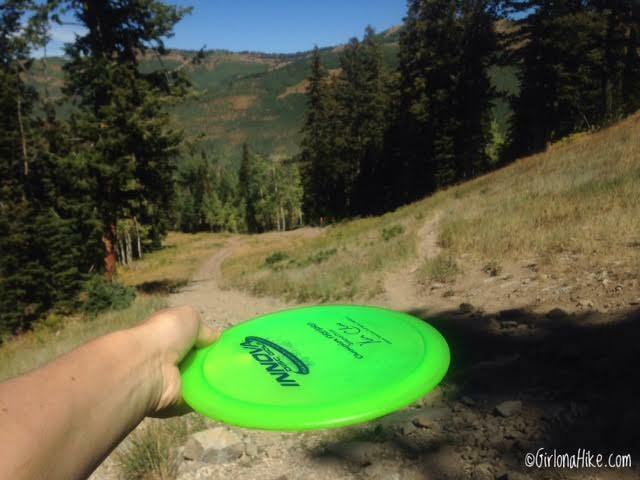 I would be out to enjoy the mountain and Fall weather, and made it my goal to get the disc in at least once, no matter how many times I would have to throw it. 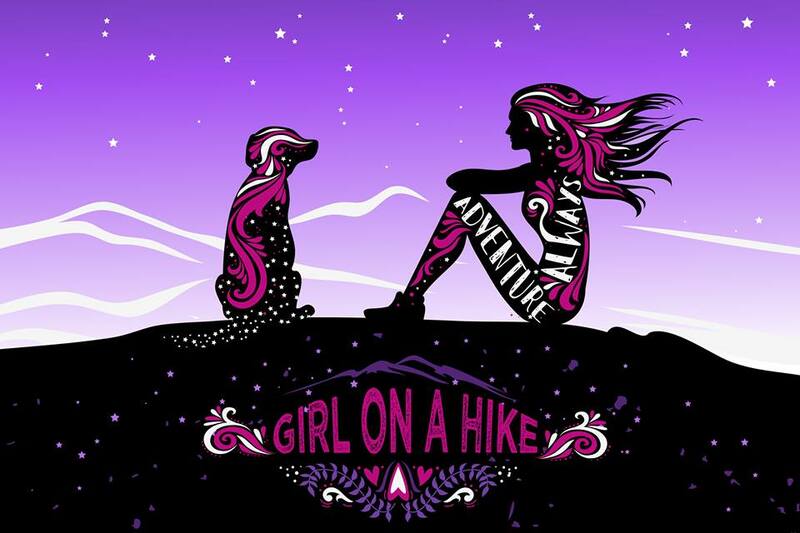 Knowing there would be hiking involved, I was ready to hit the mountain. At the end of playing, there is a $5 refund for each disc returned. 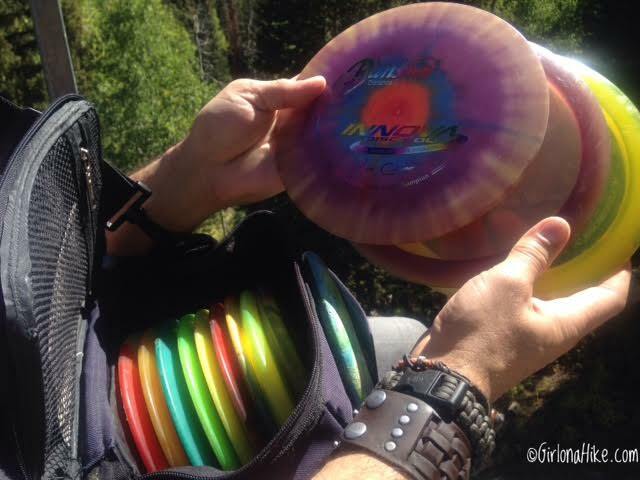 Discs are available for purchase. First, since neither of us played here we needed to check out the large map. 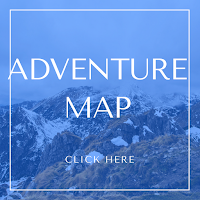 You can get a pocket map from the Adventure Center as well. The disc golf course is in the light green section. 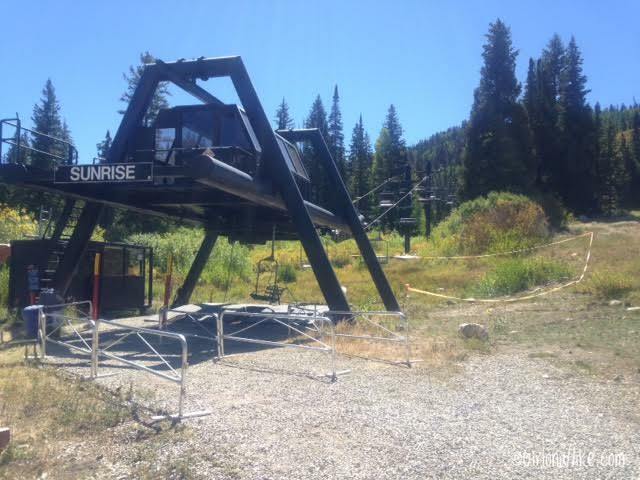 Taking the Sunrise Lift to the top! 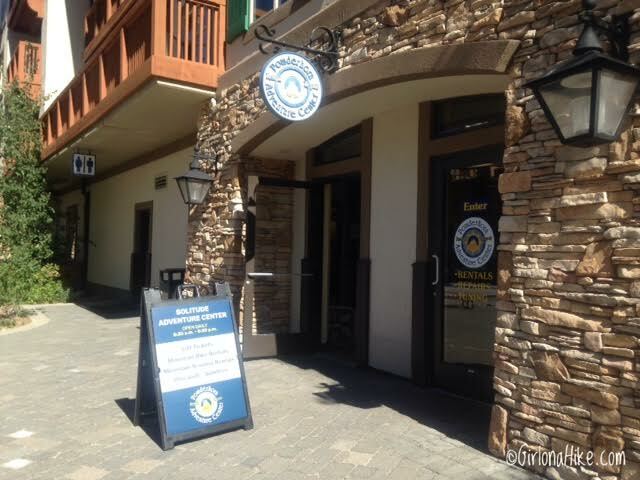 This is the only operating lift during the summer season, which runs June 17th - October 2nd. 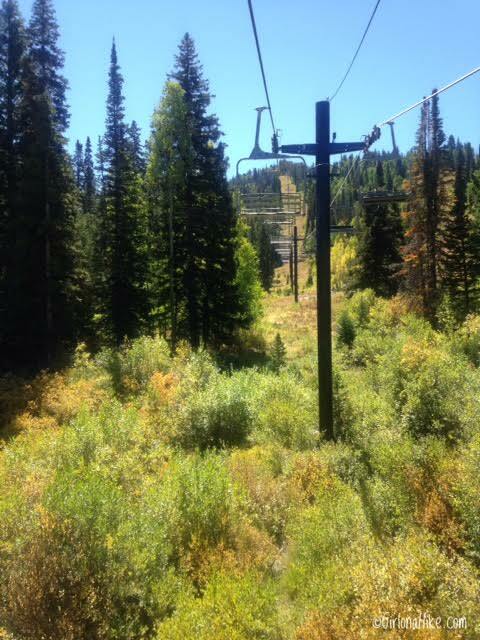 It's a very slow, 2 person chairlift. 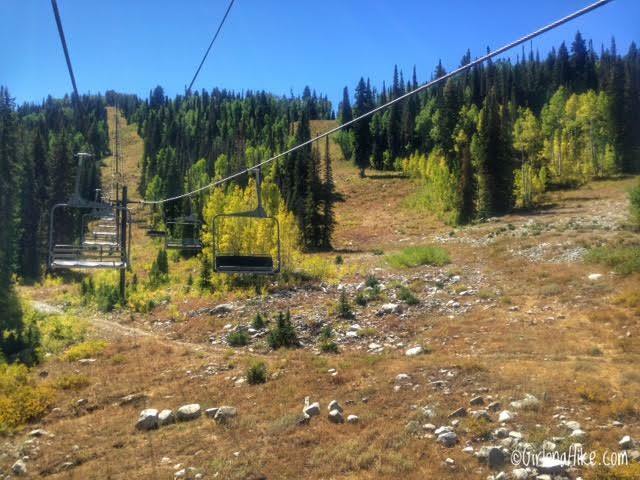 Riding up the Sunrise Lift, enjoying the cool Fall temperatures. Beautiful Fall trees! As a plus, nobody was on the course when we arrived. Don shows me what a "putter disc" looks like. These are used for beginners because they have a larger diameter, and are slower moving discs with a deep rim. The large diameter helps the disc flatten out and fly straight. 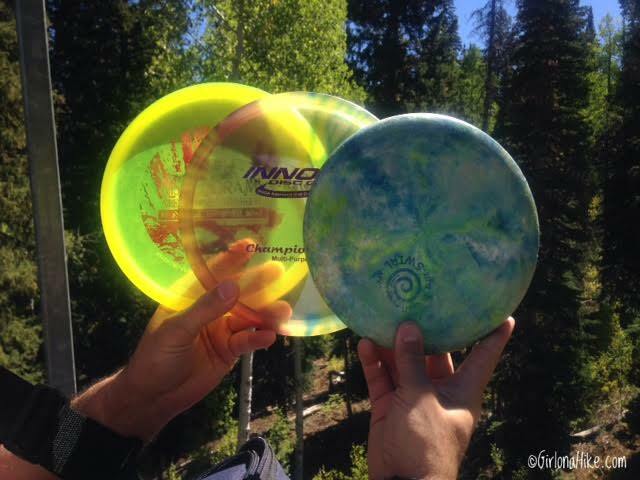 Newer players can feel up to 4x the stability in a putter disc. You can see the deeper, thicker rim here. 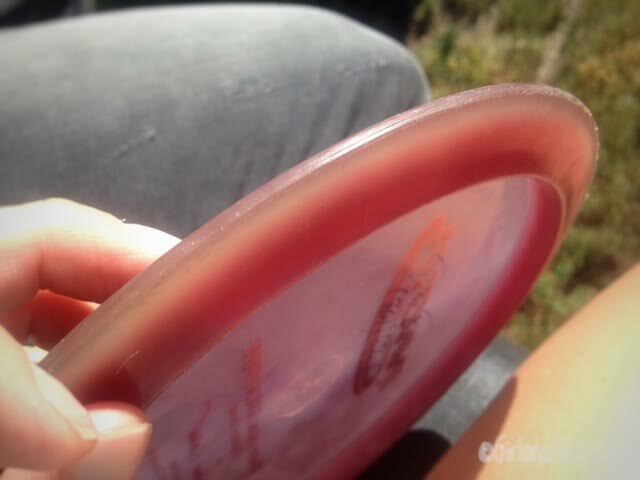 Next he showed me what regular discs look like. There are many variations of discs to choose from when buying. 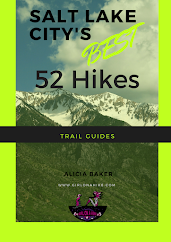 Click here for a guide and comparison. Regular discs have a much thinner rim, and are smaller in diameter. 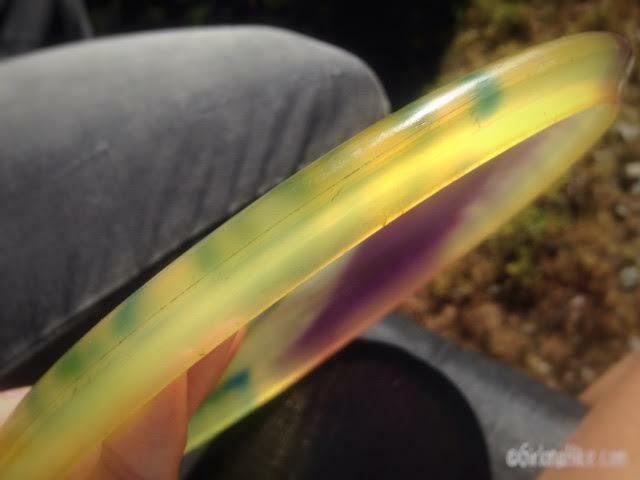 These are better for making a disc fly further and longer. As you step up to the tee, look for the basket with a bright red/orange flag on top. You can barely see it in this photo, just in front of (or above) the disc. 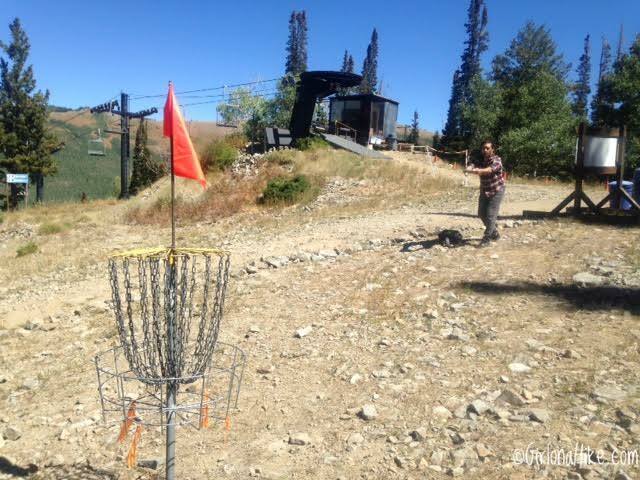 This long open section of the ski run is called a Fairway on the disc golf course. As a player progresses down the fairway, you must make each consecutive throw from the spot where the previous throw landed. The trees, shrubs, and terrain changed located around the fairway provide challenging obstacles for the golfer. Remember to keep track of your throws - the less throws you make, the more points you get and closer to winning you are. There is a "par" you should try to make. This means typically making the basket within 3 throws (stokes). Once you have the disc in the basket, that hole is complete and you move on to the next hole. Don really gets into throwing his disc. 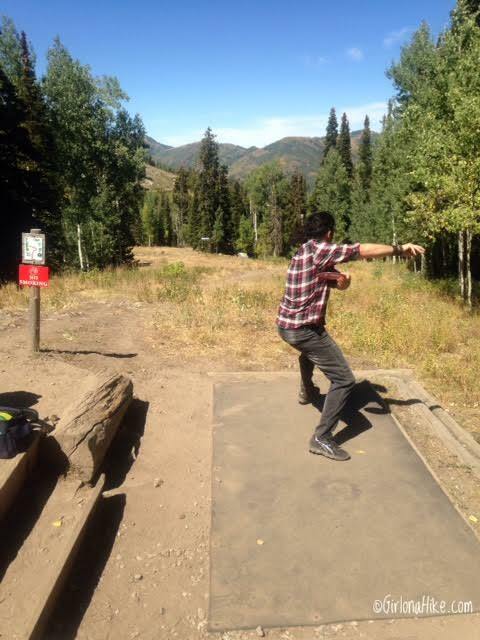 Disc golf is very challenging for a beginner, but as you can see, Don is able to throw his disc pretty far (roughly 300 ft) and has his stance ready for his big throw. I would watch him and try to emulate his moves, but just when I though I could throw my disc really far, it would just end up rolling down the hill on its rim. Not quite what I wanted it to do. 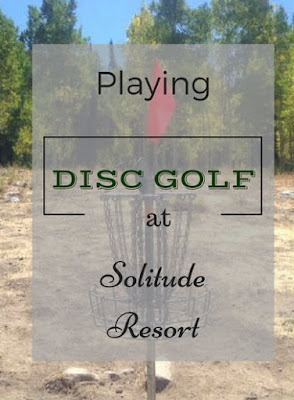 Compared to traditional golf, Disc golf was invented in the 1970s, rarely requires a greens or club fee, you also don't need to rent a cart, and you'll never get stuck with a bad "tee time". It can be enjoyed by anyone of all ages, male, female, and regardless of economic status, everyone will enjoy being outdoors. 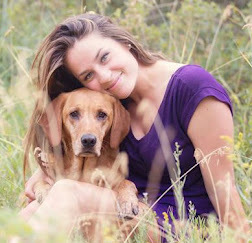 To see some how the pros do it, check out this awesome video! Where else can I play disc golf? 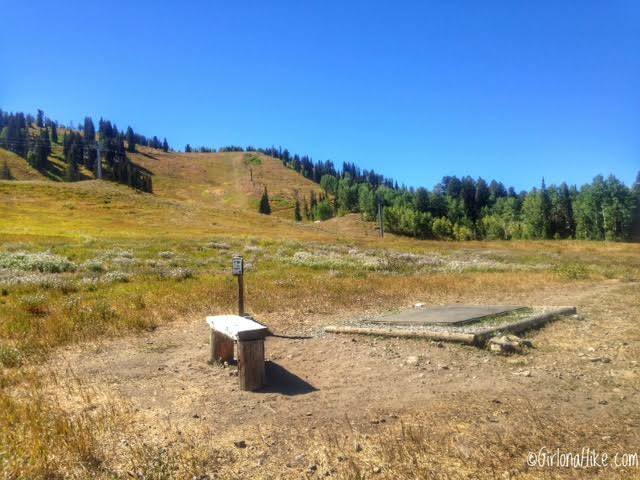 Not everyone is lucky enough to have this beautiful mountain side to play disc golf at. Most city parks have courses set up, and most are free to play at (if you have your own discs). 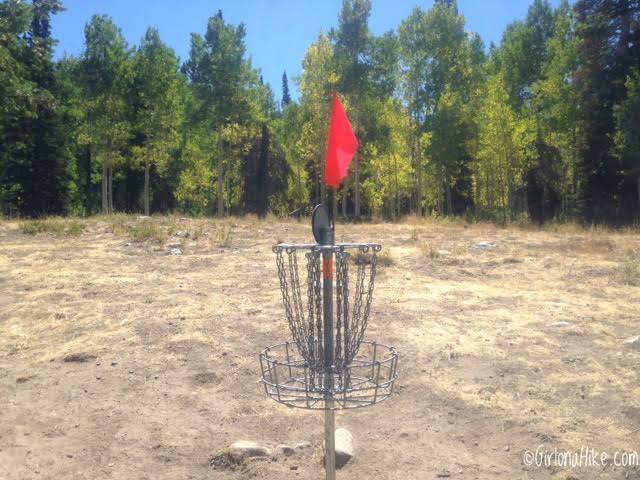 If your area doesn't have this benefit of having a permanent disc golf course set up, some disc golfers will make up their own courses in nearby parks and open green spaces, making the hole a bucket or a certain tree. 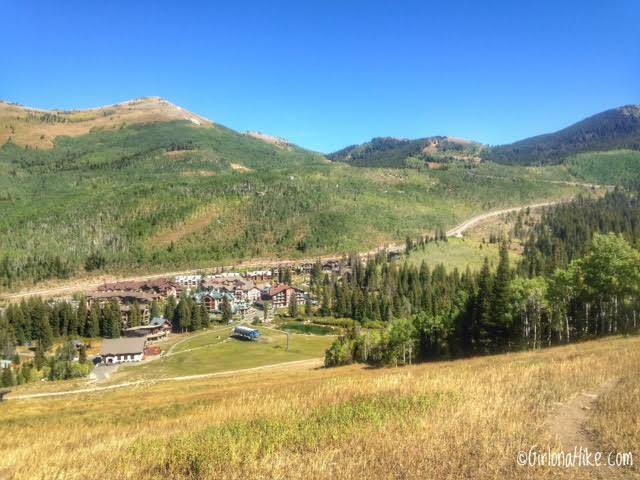 This is the longest fairway and hole at Solitude (and in Utah), at 1,219 ft! The par for this hole is 3. It took me about 9 throws! It's so far down this hill you can't even see the basket. Although I'm not hooked on the sport of disc golf, I did enjoy being outside for the afternoon and getting to take in all the beauty of the Fall weather. I would recommend playing at least once, just to try it. 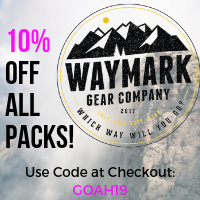 If nothing else, you will get some hiking in! We've never played but have friends that play often and really enjoy it. Looks like a beautiful course to learn to play. Awesome views:) Love the video. It is amazing how straight they can throw the disc.